In order to make it easier to update information, Vultr is running a promotion to encourage their customers to follow them on Twitter. Each click to follow and tweet about Vultr will be awarded $3. First, Visit Vultr and log into your account, press Click here to view available promos or directly go to the promo page following this link, you will see the notification. At last, all you need to do is press the Verify your Twitter button, Follow @Vultr button and Tweet button to tweet Vultr on Twitter, $3 free will be added automatically to your account. If you do not have an account, let register right now. There’re many attractive Vultr promotions waiting for you, up to $103 Free Credit. 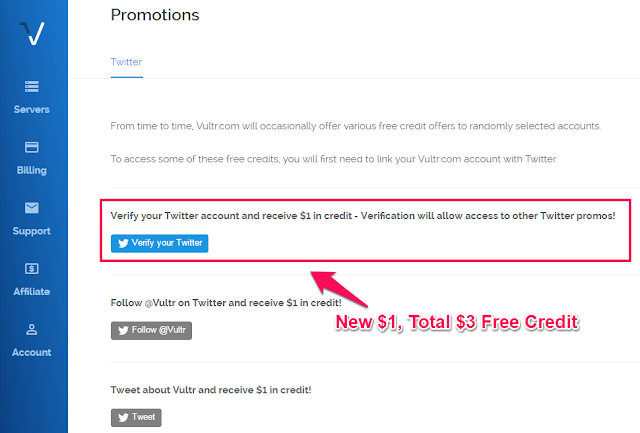 Update 30/8: Vultr has just updated a new Verify your Twitter button, adding one more dollar, so you will get $3 free credit in total. Coupon33.com is a personal blog sharing promotion information, discount coupons about domain, hosting from many providers around the world. Coupon33 © 2015. All Rights Reserved.